Staining: Tobacco, Coffee, Red Wine, general food staining. Derick full of charisma, with a great zest for life – is 75 years young. He is an Ex- Smoker and loves his coffee and booked in with Sparkly Whites to improve the stains on his front teeth. He was very realistic knowing with age your enamel gets thinner and your teeth lose their brightness and will never look as white as they did, when we were young. He underwent the 1 hour power laser and was ecstatic at the results he received in such a short time. 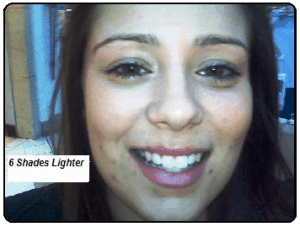 He left with a Home Maintenance Whitening Kit, and two weeks later he came in for a post treatment consultation – noting his teeth on the VitaShade guide had brightened up another shade 2 shades. Please note all laser treatments can only whiten your front ( top & bottom) 18-20 smile teeth (those you see when smiling) this varies from person to person depending on your mouth cavity size. Applying whitening gel too far back, runs the risk the gel coming into contact with your gums and potentially causing sensitivity & temporary gum burns. To whiten further back Custom Trays are highly recommended. Type of Staining: Smoking, Coffee .& General lifestyle staining. 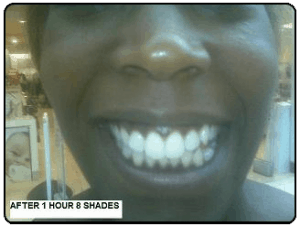 Specialists remarks: Christine had diluted yellowing on her canines and front incisors, after the treatment her teeth had brightened up 6 shades and balanced the colour of her teeth to a lovely even and brighter smile.